Introducing the first of our midweek Elevator Fortnights series, where London’s Elevator East crew showcase an earworm track from the past to satisfy your thirst for other/worldly sounds and keep you on it till the weekend. This week: May East’s ‘Maraka’. 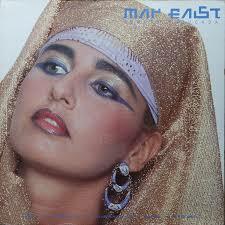 May East is a Brazilian/British singer, composer, UN representative and ecological activist who smashed the airwaves in Brazil in 1985 with her first solo LP, Remota Batucada, a unique blend of her native country’s tribal sonorities and the zeitgeist synthpop sensibilities of the time. Word has it that East was responsible for some of the best new wave records coming out Brazil in the early 80s, with tunes like ‘Nosso Louco Amor’ and ‘Perdidos na Selva’ going down in Brazilian guitar music folklore. On Remota Batucada, though, we have a more mature outing, with East merging indigenous elements and the electronics of the time to dazzling effect. Our standout track on Remota Batucada is ‘Maraka’, where bewitching 100bpm drum machine layers into percussive sounds, before the deep combo of sensual bass riff and abrupt synth chords is thrown in to set the scene for East’s haunting vocals. ‘Maraka’ is a moody 6 o’clock groover reminiscent of some of 80s South Africa’s bounciest sounds, all while banging the drum of its own slow South American tribalism. You can dig ‘Maraka’ from May East’s Remota Batucada, and watch out for the second Elevator instalment in two weeks time. Also make sure to check out the Brazilian page for more of this good stuff.